I’m actually surprised that more games don’t adopt the disco aesthetic in their design. 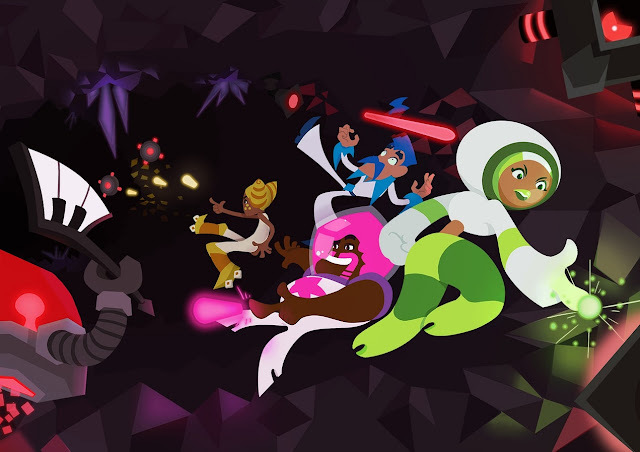 With infectious music, bright colours and striking character designs, Laser Disco Defenders positively exudes joy. It’s a 2D shooter featuring procedurally generated levels and rogue-lite influences which revolves around a unique mechanic: your bullets persist and bounce off the walls, posing danger to both yourself and your enemies. Laser Disco Defenders is frenetic, ecstatic fun but falls prey to repetition and some poor design choices after extended sessions of play. This game takes a lot of cues from other twin stick shooters and doesn’t try too hard to stray from the genre’s roots. 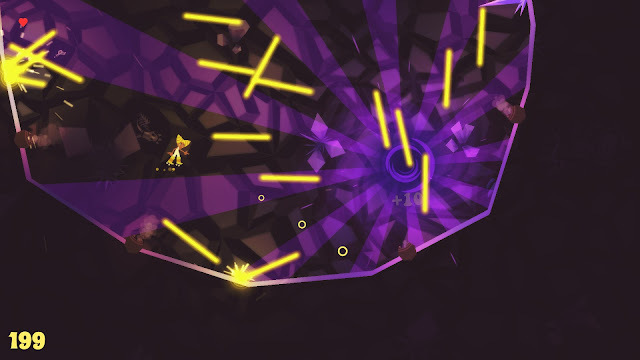 Players move through small arenas shooting enemies, and when all enemies are cleared a portal to the next stage opens up. Since lasers bounce around the level forever, it’s in the player’s best interests to complete the level as quickly as possible, lest the onslaught of light become too intense to duck and dodge. 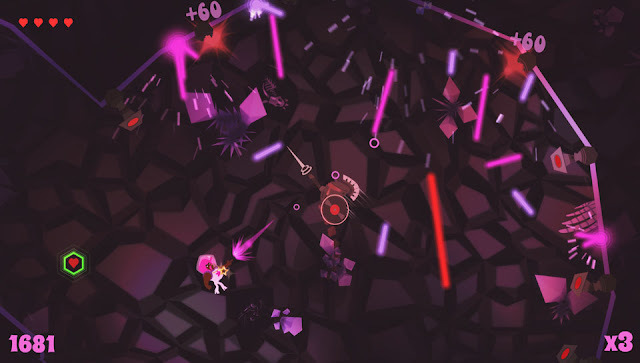 The player character can move upwards freely but is also affected by gravity. It’s an odd design choice which leaves the movement feeling loose, and will lead to a cheap death or two. Perhaps the best way to describe this game is to recount a moment where all its systems work perfectly. There is a complex enemy shaped like a knight – it slowly moves through the level towards you, and when it gets too close to you it engages with a swift lunge attack. When you shoot it however, it raises a shield which deflects your laser, leaving itself vulnerable to a strafe attack. The player is then challenged with navigating in a circle around the stationary, shielded knight to shoot it in the back, all while their first shot rebounds around the room posing a direct threat. What I love about the knight’s design is that it forces the player to quickly adapt to a variety of motivators; each encounter with the knight felt like a challenge which requires strategy and timing to surmount. Unfortunately, the knight is by far the best enemy. Other enemy patterns range from uninteresting (moves in a straight line towards you) to downright frustrating (shoots in an X pattern, but doesn’t telegraph exactly when it’s going to shoot). Because of the procedural generation, it almost feels like every challenging gauntlet of enemies is a happy accident. In other words, I would argue that the developers relinquished one of the key advantages of linear design, which is that by carefully planning and telegraphing levels, the designers can ensure that the player is 100 per cent engaged for the entire experience, and not just for the moments in which the procedural generation algorithm stumbles upon a good seed. These issues only rear their head on extended play sessions however – for more casual fans who intend to play many times in short sessions, I’m sure procedural generation was a better choice. The possibility for player error to artificially create difficulty further drives this point home, since dodging your own lasers ensures there will always be relevant threats to be aware of. I’d be much more eager to recommend picking this one up on the Vita, or for short sessions on a laptop computer. 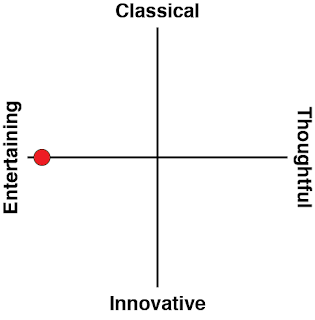 I did find the variation of levels to be lacking however. 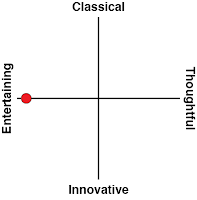 The game is divided into four worlds, each with five stages, and each world has a distinct level shape in mind. For example, the first world employs a lot of ovals and wide curves for bullets to ricochet through, whilst the second world features more circles. The existence of round or geometric walls do change how lasers bounce, leading to a slightly different gameplay experience, but as far as I could tell the enemy spawns stayed the same. It was also underwhelming to not see boss encounters throughout the game, especially since the bouncing laser mechanic could have led to some interesting scenarios. The disco aesthetic was also underutilised, manifesting only in the music and graphical style. There are a few tracks available but they only change upon reaching a new world, and since each run starts from level one most players will become far too acquainted with the first world’s song. There is a small story cutscene to frame the action, but it doesn’t add much to the game and ends up forgotten quickly. Laser Disco Defenders is missing a lot of components from being a phenomenal game or even a fantastic top down shooter. Some of the groundwork laid by the developers leaves room for excitement, but there just isn’t enough carefully crafted content to back up the solid mechanics. It’s a dance which ends too soon, and it comes as a hard recommendation.